Though I'm not interested in converting, I sometimes stop and say hello and pick up a copy of The Watchtower or Awake! out of courtesy, since I find their cheerful vibe oddly comforting. They're certainly more agreeable than the Old Navy Street Preacher, who hangs out at Randolph and State railing against fornicators and cigarette smokers. But not everyone appreciates the Jehovah's Witnesses' presence at transit stations. Kevin Havener, an Edgewater resident who often commutes via the Red Line, contacted me to share a message he sent to the transit authority, to which he says he never got a response. He claimed that the Witnesses' practice of offering literature inside el stations violated a guideline in the agency's Rules of Conduct warning against the distribution of written materials on CTA property. 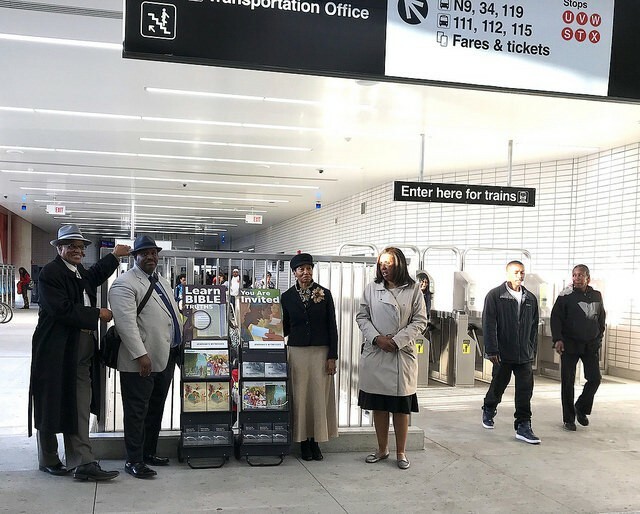 Still, it was an interesting question: Is the CTA giving the Jehovah's Witnesses preferential treatment by allowing them to camp out in stations? No, according to agency spokeswoman Catherine Hosinski. "The protections afforded by the First Amendment prevent the CTA from regulating the content of speech that is distributed in its unpaid area, regardless of whether it is religious, political, or social, or espouses a particular religious, political, or social viewpoint." Hosinski directed me to guideline #23 of the CTA's Rules of Conduct, and it was clear that Havener hadn't read the document carefully enough. "Distributing of advertisements or any other written materials or soliciting or petitioning" is indeed prohibited on trains and buses, as well as in the "paid" areas of stations. But under the rule it's permitted in the unpaid areas as long as it doesn't impede pedestrian flow. 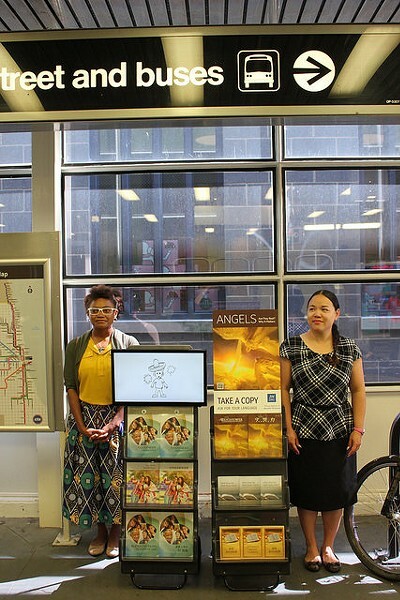 So not only can religious groups proselytize inside stations, but the CTA even allows people to offer commuters flyers for appliance sales or hip-hop shows within el stops. Martin Redish, a Northwestern professor of constitutional law, told me this policy departs from a ruling in the 1992 Supreme Court case The Society for Krishna Consciousness v. Lee. There the court found the Hare Krishnas could not do outreach within New York-area airports because airports are not a "traditional public forum." "It's clearly better that the CTA is erring on the side of allowing free speech," Redish said. "Of course, if the speakers start harassing people or not taking no for an answer, you've got a different situation." 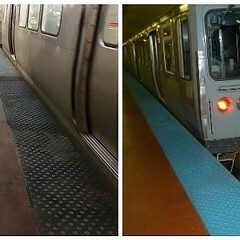 Even Tom Cara, director of the local chapter of the Freedom From Religion Foundation, which advocates for the separation of church and state, agreed that the CTA's rule seems to be kosher. "We look at this the same way as we look at a public street," he said. "Obviously people are allowed to stand out on a street corner and hand out literature if they like. 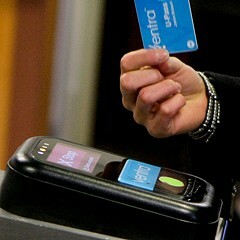 If the CTA has established this space as a public forum, then the policy appears to be legal." Cara compared the situation to Daley Plaza during the holidays, when in addition to the city's official "holiday tree," different groups have been permitted to erect a creche, a menorah, and a star and crescent. Freedom From Religion puts up a nine-foot banner celebrating the winter solstice and the 1791 ratification of the Bill of Rights and a lighted "A" sign—the international symbol of atheism and agnosticism. But if it's OK for anyone to do low-key proselytizing or handbill distribution within the unpaid area of a CTA station, why does it seem like the Witnesses are the only ones taking advantage of it, and why did the Fullerton station attendant tell the Buddhists otherwise? First off, the Fullerton attendant likely just didn’t know the rules. 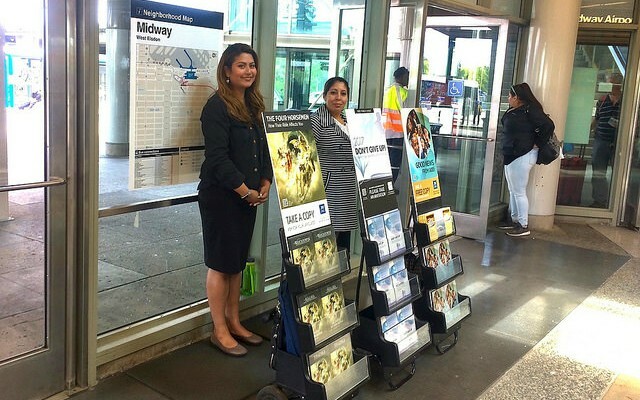 And based on a talk with Paul Schmidt, the coordinator for Jehovah's Witnesses' "Bible literature displays" in Chicago, it appears that the keys to being allowed to proselytize are being familiar with the rules, consistently showing up at the same stations day after day, and maintaining a pleasant demeanor. Schmidt said the Witnesses have been turning up at el stations on a regular basis since 2012. 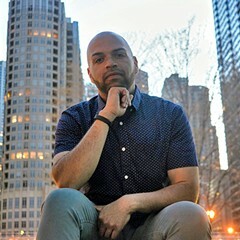 He said his organization, Chicago Special Metropolitan Public Witnessing, coordinates some 1,900 volunteers, some from as far afield as Indiana and Wisconsin, who distribute literature 12 hours a day, seven days a week, at 19 different locations. The majority of these are downtown CTA and Metra stations; Navy Pier, the UIC student center, and the el stops at Midway and O'Hare are among the other locations. I've also recently spotted Witnesses at the 95th/Dan Ryan and Wilson Red Line stations. 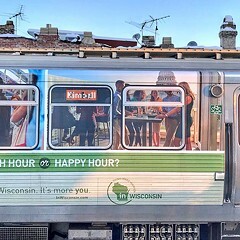 Facebook friends told me they've encountered the snappily dressed evangelists at the Kedzie Pink Line and Montrose Brown Line stops, as well the Metra station near Irving Park and Pulaski and the Jefferson Park Transit Center. Schmidt explains that neighborhood congregations have taken the initiative to staff these and other locations independently, on a more sporadic basis. Schmidt said his organization has never formally requested permission from the CTA to conduct what he calls "Bible education work," but volunteers usually approach the station attendant to tell them what they're up to. "We want to make sure we're in compliance with any laws, but also exercise our legal right to publicize our faith." "One of the reasons that the CTA and the police have been so good to us over the years is because we're not aggressive," Schmidt added. "We're not going to shove a piece of literature in people's faces. We're there if they want to talk to us." That doesn't mean that the volunteers don't occasionally get static from train riders. "When you put your faith out there in a public setting, some people are going to disagree with you," Schmidt said. "Some do it more vocally than others. We have the right to exercise our religion and freedom of speech, but everyone around us does too, so that's just part of the deal." The dirty and grimy tunnels are downright embarrassing at times. "It's unacceptable," one rider says.